Emotions are my best friends. They help me not only understand my present state but also how my body is doing. Researchers are discovering that an imbalance in your gut can cause mental symptoms. They call the gut the second brain, and boy are they right. I have witnessed firsthand those with ADD, anxiety, depression, and despair turn completely around when they fixed the microbes in their gut. 90% of the body’s total serotonin is produced in the digestive tract. Only 5% of serotonin is produced in the brain. Serotonin is a neurotransmitter which influences many aspects of your behavior such as mood, appetite, and pain sensation. The right amount of serotonin in the brain produces a calm and happy feeling. Researchers have established a compelling link between gut bacteria and mental health. They’re still trying to figure out the extent to which the human micro population that is established in early childhood can be transformed. In a study led by John Cryan, a neuroscientist in Ireland, anxious mice dosed with the probiotic bacterium Lactobacillus rhamnosus showed lower levels of anxiety, decreased stress hormones, and even an increase in brain receptors for a neurotransmitter that’s vital in curbing worry, anxiety, and fear. I have witnessed this for myself in others, and I know this to be true. My life feels dramatically different than it did a few years ago, and I cannot wait for each and every day; but I did not always feel that way. Fourteen years ago I was living in despair and I started chasing hope like there was no tomorrow. Desperate to find help for my body and help for my family, I was a woman on a mission to find hope any way possible; and then life turned around dramatically. I trained myself to find the things that would make me feel good physically and this website is the result of that journey. I don’t just feel good, I feel fantastic most of the time and I am loving it. I never felt like this in my twenties or thirties and I think it is the only way to live. The best way I can describe it is passion, joy, and wellness. It makes every day magical. I have a lot of energy and feel like I have enough to carry out my mission on this earth, and that includes helping each and every one of you. It is not just the food I am eating that makes me feel this way, but this is where it all started. I started to feel better physically, and then I connected to my mind and soul in a way I had never connected before. My life’s purpose started unfolding before my eyes, and if you could see me writing this blog you would see the emotion that I feel and how very grateful I am to have found the answers that changed my life. Let me explain to you some of the things that I believe changed my inner world, and as a consequence changed my mental state, my body, and my spirit. Look at what's in eight ounces of Kombucha. Do you know what all of this means? Do you see the billions of probiotics? Let me tell you about one of the probiotics found in kombucha called Saccharomyces Boulardii (S. Boulardii) which is actually a good yeast. It is used as the number one probiotic in hospitals, called Florastor. S. boulardii has digestive benefits that support the immune system. When you support the immune system, your body is in a calm and relaxed state. 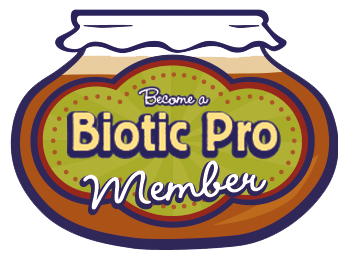 These probiotics help nourish the cells that support the intestinal epithelium and repair the gut, which is a first-line defense against invaders to the body. 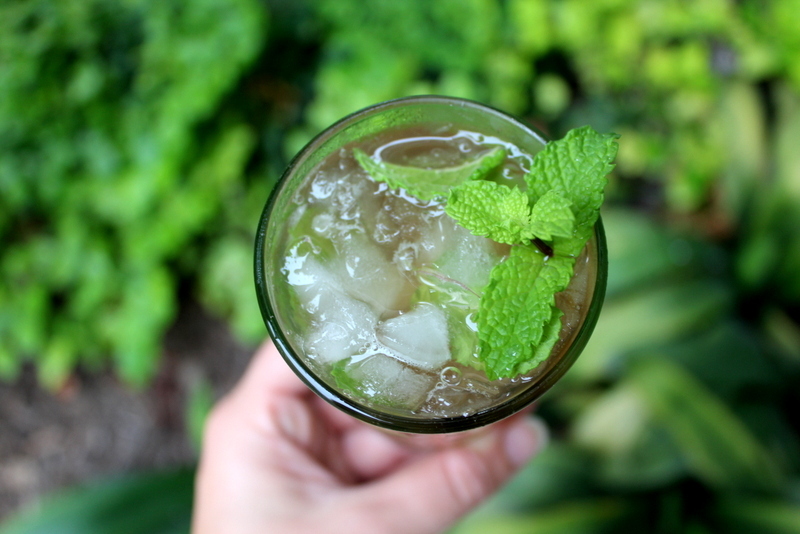 Drinking kombucha can make you feel great. I have noticed I always feel better about 20 to 30 minutes after drinking my kombucha. It also is a probiotic that can’t be killed by antibiotics. Kombucha, as well as all the cultured foods, has B vitamins. These B vitamins help nourish your adrenals, which control your moods and start you on the road to feeling better. I call B vitamins the happy vitamins. They make you feel great when you have enough of them. And guess what helps you absorb them? 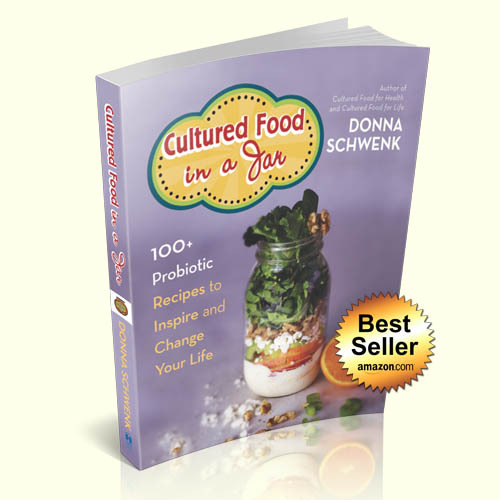 You got it – good gut flora. You can’t absorb what you need without lots of the right microbes in your gut. When you lack the right microbes, the results are emotions that run amuck and an overall feeling of despair or anxiety. Your adrenal glands manufacture a number of hormones such as cortisol, adrenaline, aldosterone, estrogen, and testosterone that regulate body fluid balance, blood pressure, blood sugar, and other central metabolic functions and help your body cope with stress. Each of the B vitamins is essential when you have any kind of stress, be it physical or emotional. It helps with everything from mood to DNA synthesis to energy production. Strong emotions cause the adrenals to release extra reserves of the stress hormones adrenaline and cortisol. And, because the production of these hormones requires a lot of nutrients, including B vitamins and magnesium, excessive emotional demands will exhaust the adrenals. A “nervous breakdown” is actually adrenal fatigue, or when the adrenal glands can’t deal with the amount of stress they’re experiencing. Adrenaline is closely connected with the sympathetic nervous system. Perhaps the very reason you are having these strong emotions is because of things going on in your gut as well? In this article from The Verge, (see article here) UCLA researchers showed in one 2013 proof-of-concept study that healthy women who consumed (twice daily for four weeks) a drink with four added probiotic strains showed significantly altered brain functioning on an MRI brain scan. The women’s brains were scanned while they looked at photos of angry or sad faces, and then asked to match those with other faces showing similar emotions. Those who had consumed the probiotic drink showed significantly lower brain activity in the neural networks that help drive responses to sensory and emotional behavior. The research is “groundbreaking,” says Cryan the researcher, because it’s the first trial to show that probiotics could affect the functioning of the human brain. Most B vitamins act as co-enzymes, which means that they help form enzymes to become catalysts in biochemical transformations throughout your body. When you have enough, you can feel it. Your mood will shift and I believe it is one of the big reasons I feel happy most of the time. All the cultured foods have B vitamins in them and having good flora in your gut helps you absorb and use these critical vitamins. 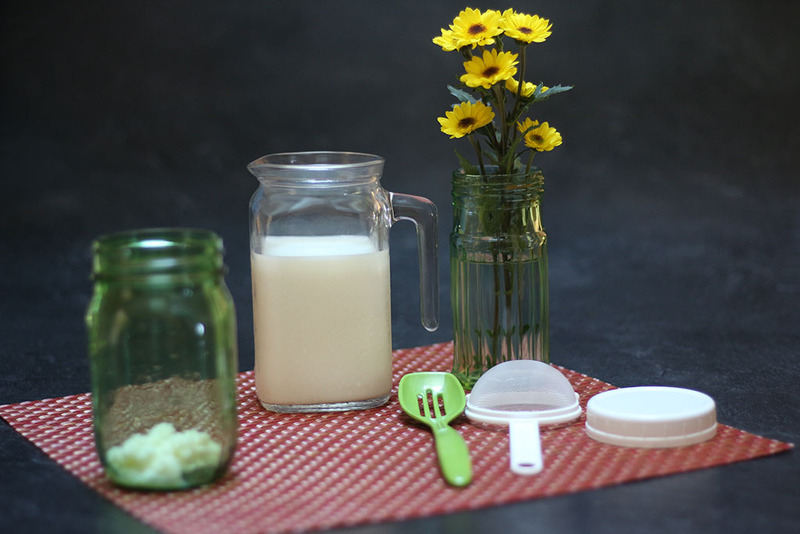 One cup of milk kefir has half of the B12 you need in a day. I always have two cups of kefir for this very reason, B12 keeps me calm and feeling good. B12 keeps the body’s nerves and blood cells healthy, helps make DNA, and prevents anemia. Another key vitamin that is abundant in cultured foods is vitamin C, which is also key in helping support your adrenals and a myriad of other process in the body as well. Vitamin C is absolutely essential for adrenal function. Vitamin C will allow you to respond properly to life’s stressors and recover more quickly from them. Cultured foods not only supply you with a ton of vitamin C (one cup is 700 milligrams of vitamin C) but they also allow you to better absorb it throughout the body. 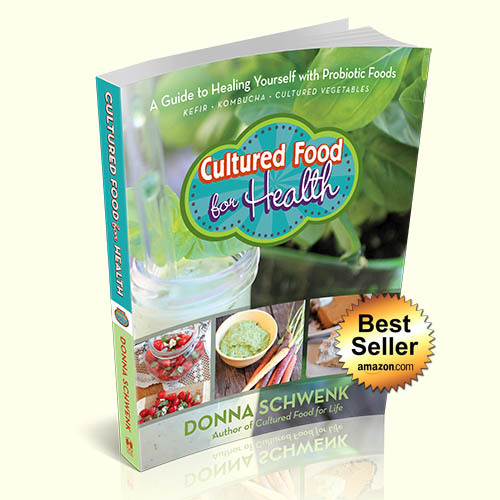 Good microbes heal the the gut and allow better absorption and digestion from all your foods. 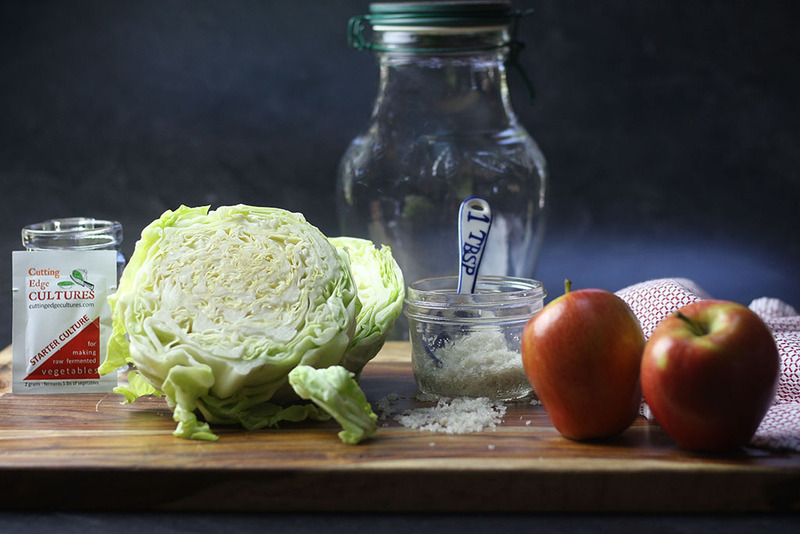 Cultured vegetables and kefir are abundant in vitamins C and B. Vitamin C has many, many functions in the body and since it is water-soluble, and not stored by the body and is eliminated in urine, we require a continuous daily supply in our diet. 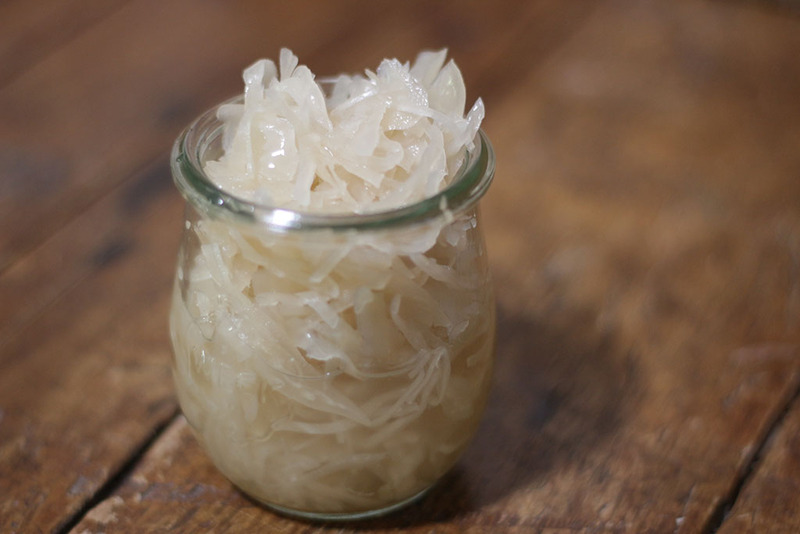 Change the bacteria in your gut by adding probiotic foods. Heal and nourish your adrenals and watch your mood lift and your body heal. I could write page after page about this, but I need to make dinner for my family. Such is my life, little bursts of writing, then it is time to eat again. One of the greatest pleasures of being a human – eating wonderful food and sharing it with others. Especially cultured foods. 29 Responses to "Can You Make Happiness in Your Gut?" What’s the difference and benefits to keifer drink vs kombucha drink? They have different good bacteria and yeasts in each of them. The benefits vary from person to person but they are many more benefits when you consume different cultured foods and I recommend doing all of them. Hi Donna, You’re an inspiration! I’ve been lacto fermenting cucumbers and cabbage. I love the taste and all the probiotics. I’ve recently found out through blood testing, I’m allergic to yeast, both brewers and bakers. 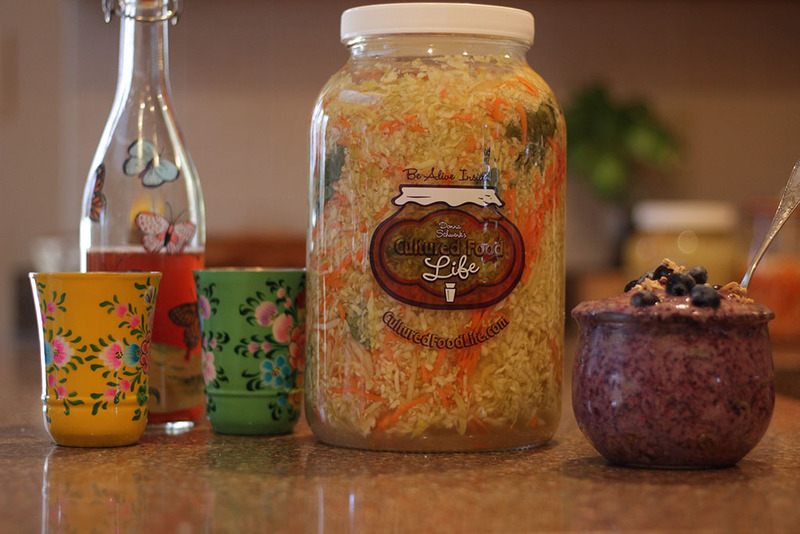 Is it still beneficial for me to eat my fermented foods? I also tested positive for dairy. 🙁 I still need to talk to the dietician but I wanted to get your opinion first. I HAVE BEEN WAITING FOR 3-4 DAYS FOR THE VEGGIES TO SHOW BUBBLES FOUND IN FERMENTATION. THE MASON JAR IS IN A COLDER ROOM BECAUSE I KEEP THE THERMOSTAT LOW IN WINTER TO SAVE MONEY. 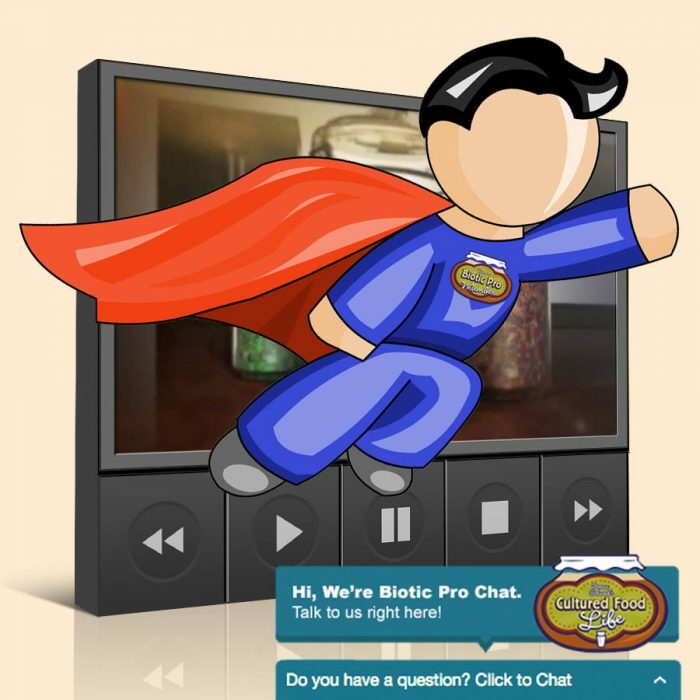 WILL IT EVENTUALLY SHOW BUBBLES OR DOES FERMENTATION TAKE PLACE WITHOUT BUBBLES? WILL PUTTING IT IN THE OVEN @ 200 HELP? Yea it doesn’t ferment well at coldr temperature but 200 degrees is to hot and will kill it. Can you put it near a heater duck? It needs some warmth to culture but not hot heat that kills it. Your such an inspiration to me. I’ve had severe depression and anxiety for 21 years, though recently, its got worse. Reading your articles on how gut health plays a vital role in minds and body. This gives me hope in what seemed a very daunting presence, and I feel a light at the end of the tunnel. Thanks to your story, I’ve started fermenting and culturing foods. Been making mk, which I been drinking now for two weeks, and just added more to my daily regimen, but last night and today my gut is bloated and acid feeling, feels flamed, I don’t know what’s causing this, I’d hoped it get better. Ill give it time. I also finally brewed kt, and doing kraut, kimchi, and veggies. I really really need help and guidance. How much are you drinking? You need to go slowly in the beginning as your body adjusts to it. Take some days off or reduce the amount. This is a lot of good bacteria that will kill bad bacteria and can make you feel bloated as it kills of pathogens in the beginning. Hi, thanks for your reply. I normally drink about6-8 o z one time a day, I love it and I could drink it all day long. Right now I’m drinking it 2-3 a day because I’m on antibiotics (i know i should not take them but needed) so I take it an hour to two hours after dinner to replenish what meds kill. But, I also eat sauerkraut at night about 2 tbsp, kt, and pickles and juice. So I think I’m overdoing it, but I’m getting a little better. I’m not trying to drink so much mk because of fat content and I dont want to gain a ton of weight. I recently found raw milk, and love the difference in taste and texture, it’s coming out so creamy thick, I could probable make cream cheese from it but I don’t I love the milk. My grains are growing quick now. I noticed that with less grains and more milk that it grows faster and is thicker. I tried coconut kefir but it didn’t take at all. Well thank you so much, I’m going to keep a journal with what I eat and my effects that day. 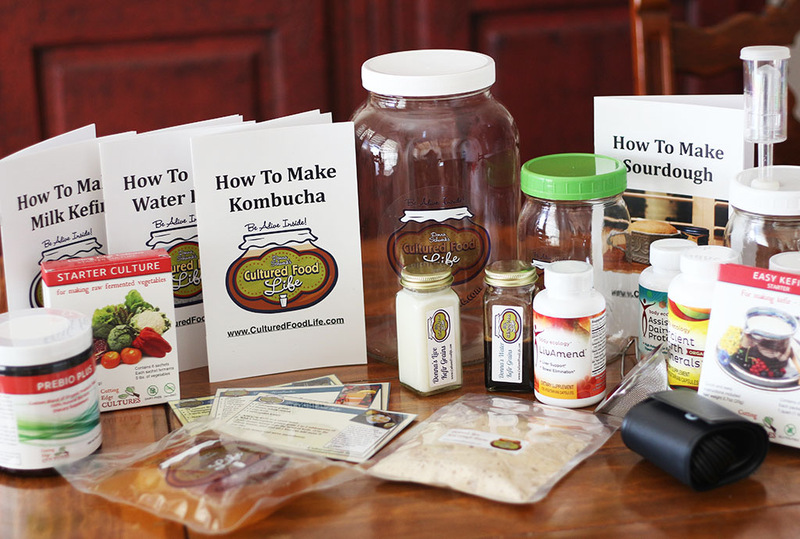 Where can i get a starter for kombucha? I’ve incorporated fermented vegetables into lunch and dinner; before each I have a generous serving of either cabbage, beets, or carrots, or some combination of two of them. I also usually have eight ounces of cranberry kombucha in the morning – I was on an antibiotic for a urinary infection recently, and realized this would prevent a recurrence, which it has. In fact, I was always running a low-level infection, I now realize. I’m wondering if you use organic sugar when making Kombucha tea or if you think that the regular stuff is O.K.? I have done both and they both work just fine and organic is better but regular is ok too. Yes it should ferment out in about a day but watch it it can get explosive. Thank you so much for all that you teach. Because of you I have begun culturing foods. I have long standing candida problems and am extremely sensitive to sugar. I would like to take kombucha but what I buy says it has 2 grams of sugar per bottle. 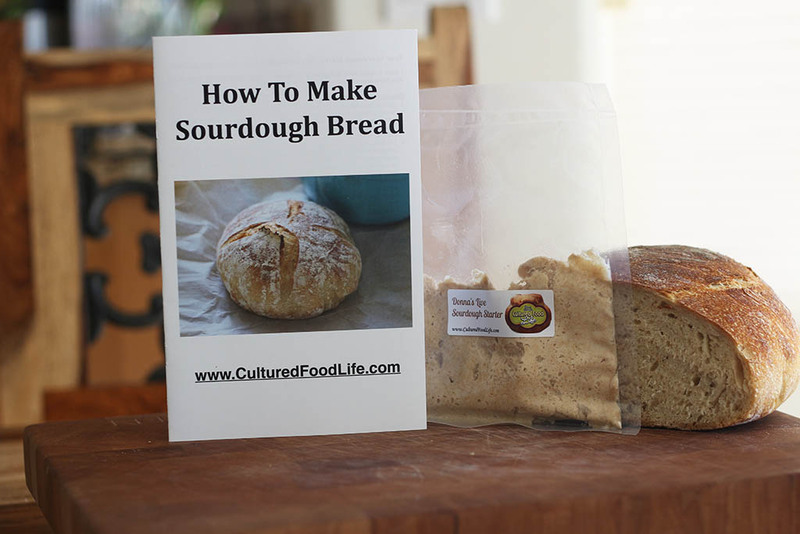 I have also found a culture so that I can start my own. Is there any way that I can get rid of the remaining sugar. If I leave the bought Kombucha at room temp. will it consume the remaining sugar? What about home made. Will I be able to ferment out all the sugar without killing my scoby? Yes you can and it will turn very sour and eat all the sugar the longer it site. When you taste it just make sure their is no taste of sweet and it will be good for you to drink. Overly sour is not better just get it to the point where the sweet taste is gone. 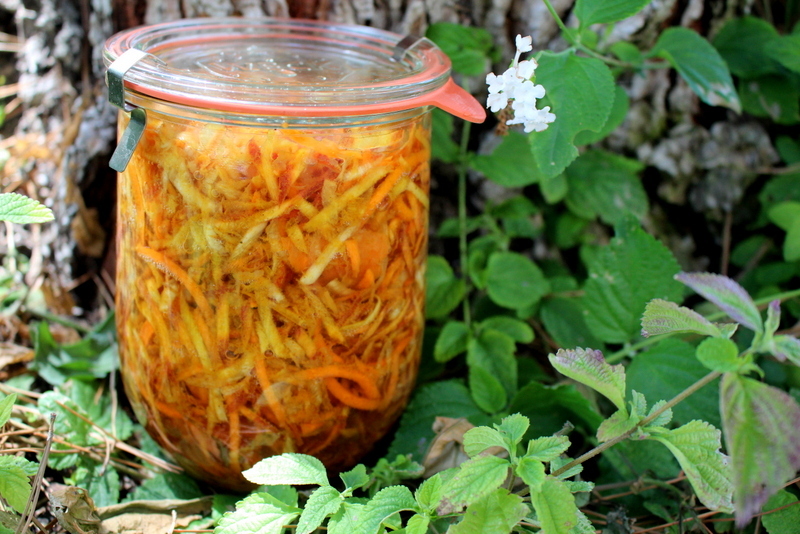 I am looking forward to starting to ferment again. 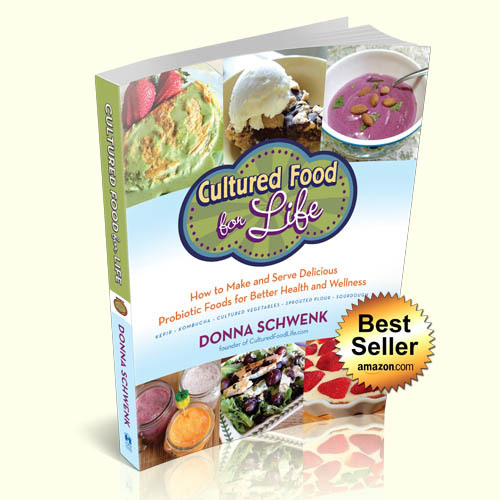 I use to ferment milk around 6 years ago and like you Donna — it was the miracle I was looking for in my health search. I am a total vegetarian and wish to become vegan — that has been a big trial in my life so far. I am mostly raw now and wish to continue to supplement my health to the fullest again. I am looking forward to your quideance and buying your newest book. 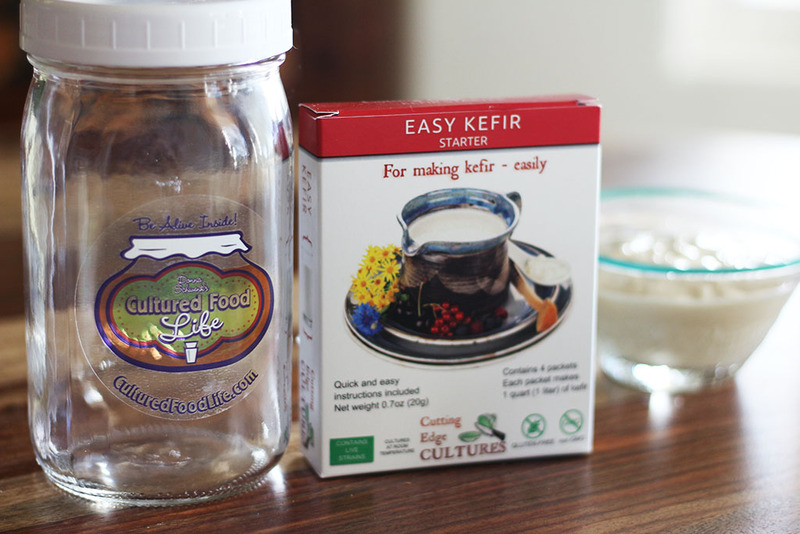 I need to get my kefir grains again. 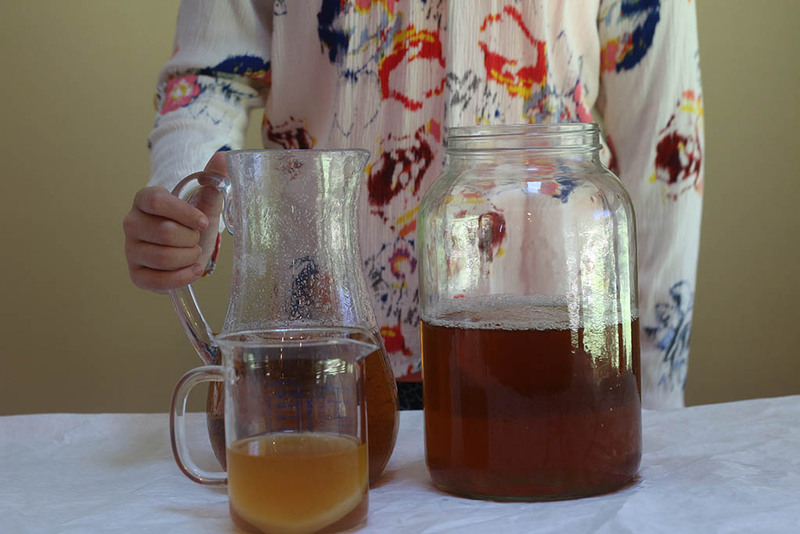 I also want to start my own kombucha — this is a goal. thank you so much — I am very excited. 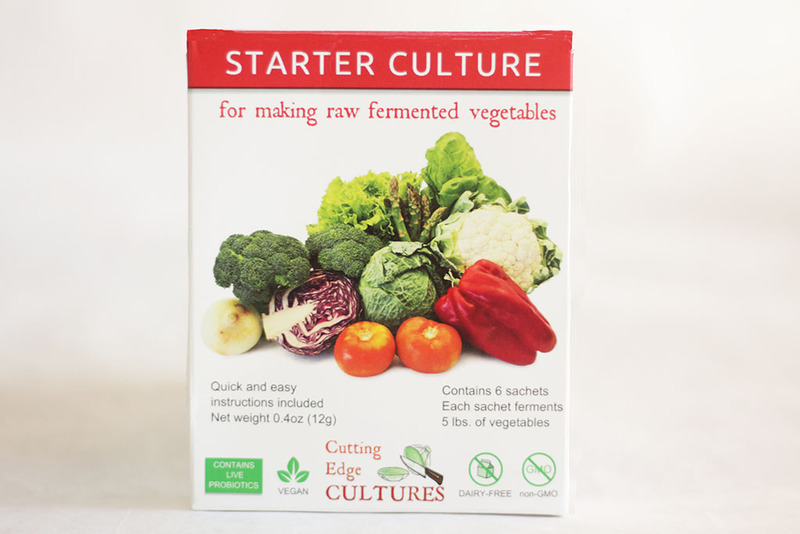 I started my fermentation journey with fermented vegetables made with celery juice and whey which I eat every day. 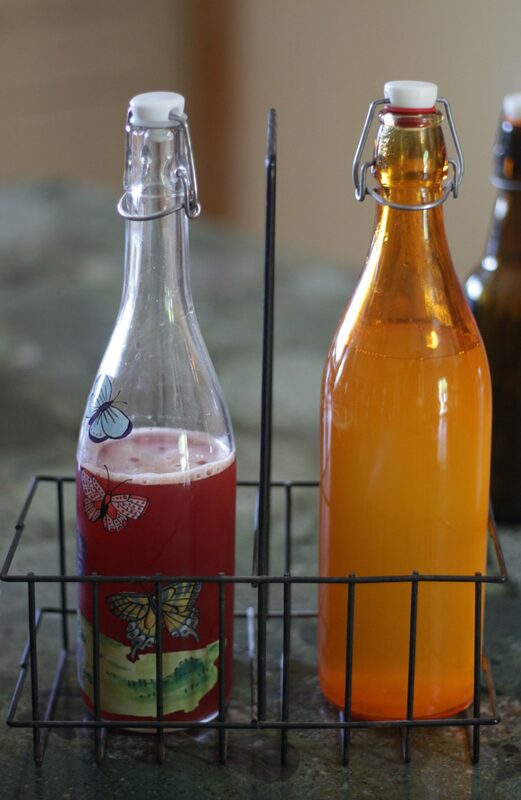 Since I read your information about the trilogy I’ve been researching kombucha and am very interested in learning to make it. I’m very caffine sensitive though and my research has come up with such diverse information that I am confused. It would be very much appreciated if you could clear this up with your helpful insight. 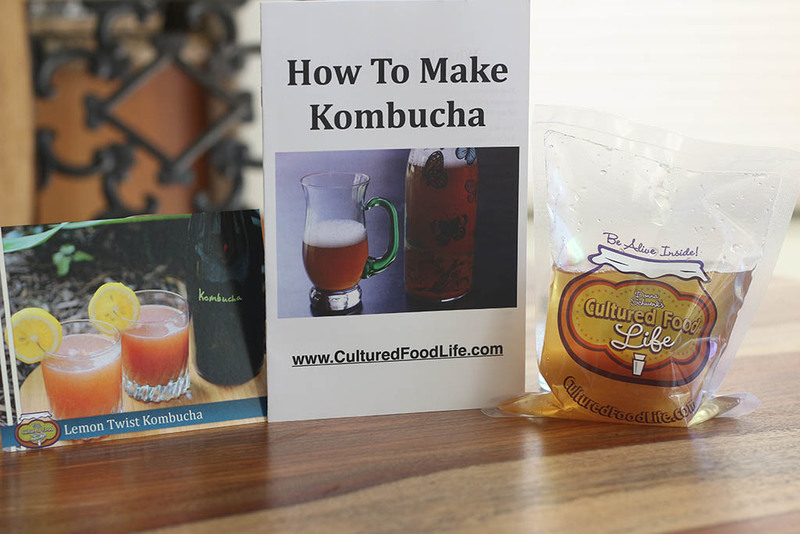 Kombucha does reduce a lot of the caffeine but not all of it. A small amount remains. I use decaffeinated green tea when I make my Kombucha. I so love all your articles! I’ve fermented different veggies and milk kefir. I feel so happy too. I’m going to have to try my hand at kombucha soon! 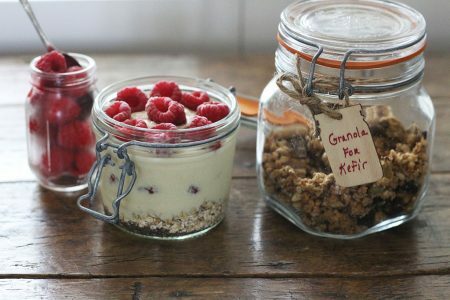 I really am enjoying using kefir. 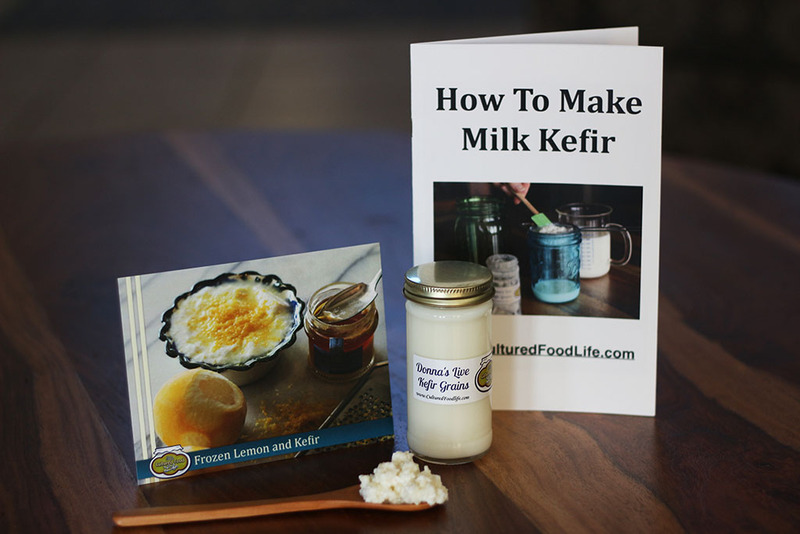 I have been doing the kefir thing since March. Recently I discovered some black spots in my kefir and it smelled funny. What is going on and what can I do to make it better? I use 2% lactose free milk. You can’t make kefir with lactose free milk because kefir eats the lactose out of the milk and makes the probiotics. Eventually your grains will die which sounds like is what has happened. 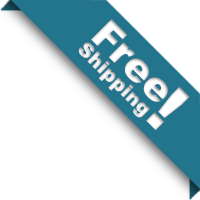 There is no need for lactose free milk because kefir is 99 % lactose free. Awesome post! Thanks for sharing your knowledge, you are an inspiration! I’ve noticed that I have never been more motivated and happier since drinking kombucha. I wish I had known about kombucha a long time ago and swear by the effects it has on your mood. All the vitamamins and acids kombucha contains, it’s like taking a liquid vitamin that you make yourself without the cost. Thanks Donna for informing me about this wonderful food. 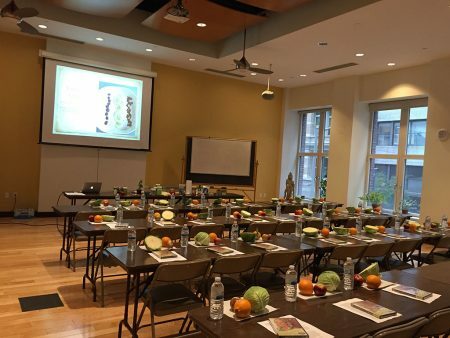 Thank you for taking time to share your experience and knowledge. Can hardly wait for your new book. Mine is ordered.